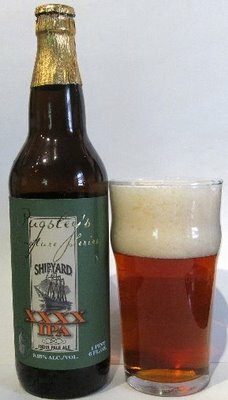 Preface: Thanks to the folks at Shipyard for send me this sample of their special brew. Appearance: A crystal clear copper penny colored brew with a carbonation of very small bubbles. The head is a very light sandy tan rocky head of large and creamy small bubbles that tat some of the fanciest Belgian lace I have seen in a long time. Aroma: First impression is floral hop cone fresh almost peppermint. Second impression picks up a prune and a bit of roasted grain. The third time reveals the rich malt barley aromas. Mouth feel: This is a big assed (seriously) brew. Flavor: The first is a refreshing sensation followed by a very sweet sensation of grain and burnt sugar candy. The second sip has the hops in the front with a vengeance. There is also warmth that can be attributed to the 9.25% alcohol by volume. The third quaff was bitter hop spikes skewered by the alcohol into a serious spike of metallic flavor. Finish: The finish takes so long that the finish of the first sip was still saying goodbye when the third swallow pushed it aside and left its calling card and lasted for a long time leaving an almost anis finish. Comments: I am not a big fan of extreme brews and this is a big beer. If it were late in October I might suggest this as an afternoon warm-me-up brew, sipped slowly before supper. As it is a summer morning I feel as if it is out of its element and yet I just might let the next hour or so slip by as I actually finish this 225 ml bottle. In the chance of being repetitive, I think a bowl of shelled walnuts and three or four samples of local cheddar cheese would do this brew no harm.